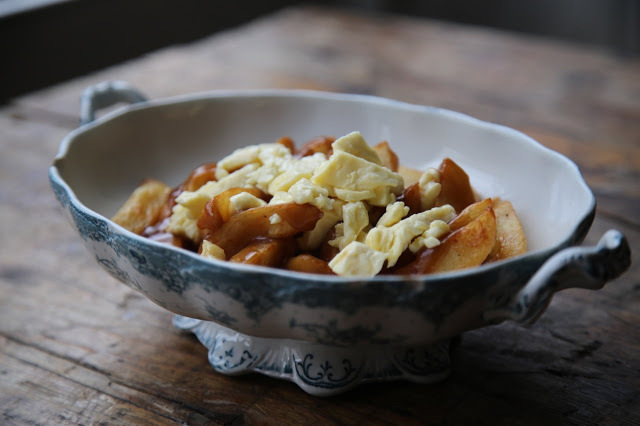 A year ago I visited Canada, discovered how maple syrup was extracted from trees and ate poutine, a messy but comforting national dish, consisting of chips, gravy and squeaky cheese curds. 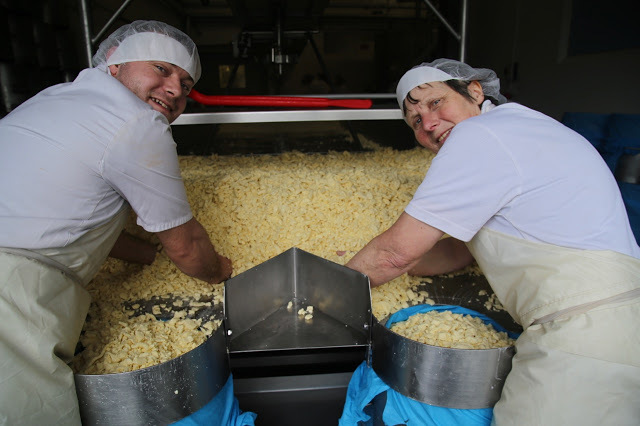 The cheese curds are a first step in the cheddar making process prior to pressing the 27 kilo cylinder moulds into a traditional truckle. 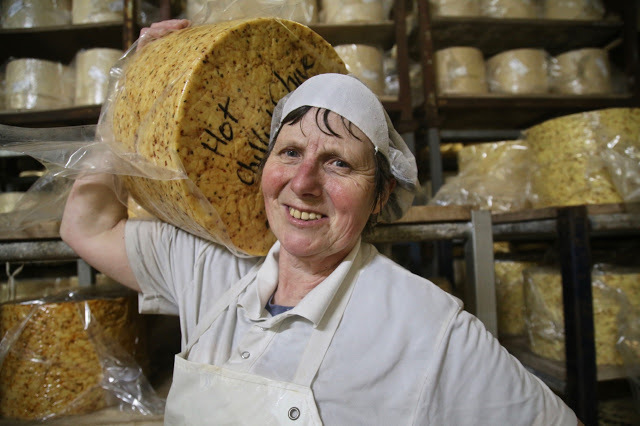 Gould’s are one of the original Cheddar making families along with the Keens and the Godminsters. “The Gould style of cheddar is buttery smooth with nice caramel tones. Even when it’s extra mature, the smoothness remains. The older cheddar attains a nutty flavour.” says Dan as we sample the different flavours and strengths of their cheese. Jean Gould Turner inherited the cheese making part of the farm, named Batch farm, after her father’s death while her brother Fred took over the herd. I see large brass instruments in Jean’s house across the road, the old school house, where we eat a ‘poutine’ lunch. 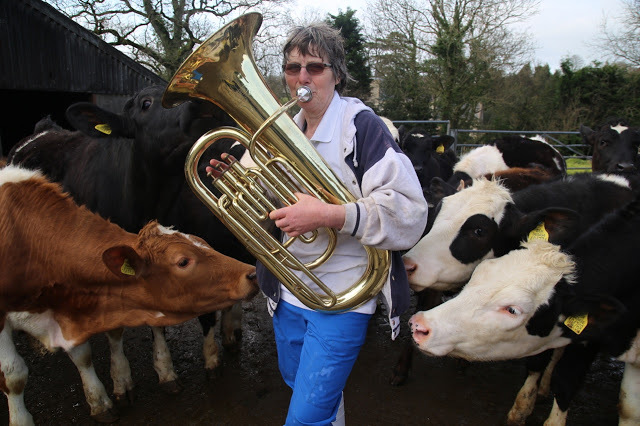 Jean Gould Turner plays in a brass band in her spare time. 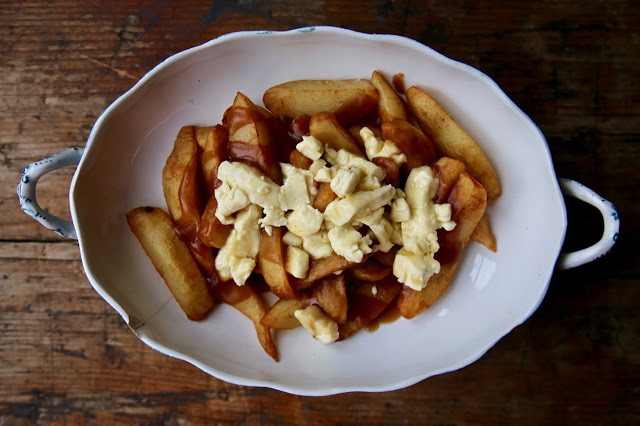 So where can Londoners get cheese curds to make their own poutine? Every week Gould’s drive up to North London, to the farmer’s markets at Parliament Hill, Islington and Queen’s Park. To pre-order the curds email shop@gouldscheddar.co.uk. Cheese curds have a shelf life of five days but can be frozen (but they may lose some of their squeakiness). Deep fat fryer or deep frying pan with chip basket. Bring your oil up to 145Cº. Have a wide tray or plate covered with kitchen towel next to your fryer. Fry your chips for around five minutes until they turn slightly translucent. Drain the chips and lay them out in one layer on the kitchen paper. Sprinkle with good sea salt. In the meantime make the gravy. Add the oil or butter to a medium saucepan on a medium heat. Soften the shallots until golden then add the garlic and bay leaf. Sprinkle the flour into the mixture, stirring rapidly, then add the soy sauce and mushrooms. Add the red wine then the stock, stirring. Cook until thickened, add the truffle oil if you want a touch of luxury. Set aside. Raise the temperature of the fryer to 180cº. Put the chips back in the fryer and fry until golden. Replace the kitchen paper on the tray and when the chips are cooked, tip them onto the fresh kitchen paper. Blot them and plate them. Pour the gravy on top ( you won’t use all of it). Add the cheese curds and serve hot. This dish can be reheated in the microwave. I have to admit I wasn't a massive fan of poutine until I made my own. Now I love it.